The Belt, a renovated alley in downtown Detroit, will be home to two new bars in the fall — Standby, a cocktail bar and restaurant, and The Skip, a casual, outdoor bar. “Visitors will find thoughtfully created craft cocktails, great food, and consistent quality in a creative, comfortable atmosphere,” says Anthony Curis, a partner of Standby and The Skip, along with Joe Robinson, Brendon Edwards, and David Goldman. The Skip will be a 45-seat outdoor alley bar that will feature frozen drinks and pitchers of beer. “It’s an effortless, no frills, and communal environment with great music, public art, and rotating food trucks on site,” Curis says. The Skip will be open only throughout the spring, summer, and fall. 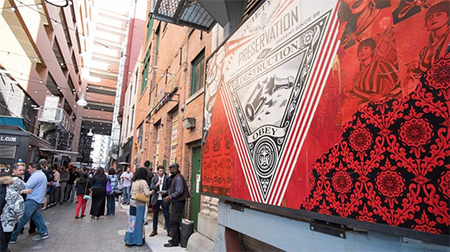 “The addition of the restaurant and outdoor alley bar will only enhance the experience and create a more social environment that will bring people together,” says Dan Mullen, executive vice president of Bedrock Real Estate Services in Detroit, which worked on the project. Street artist Shepard Fairey completed painting a mural in The Belt last month as well as on the north side of the Compuware Building.